The Luftwaffe Verscuchsverband (the Trials and Research Unit of the Luftwaffe High Command) flew and evaluated new Luftwaffe aircraft types and captured Allied fighters. This clandestine unit started as the civilian Hansa Luftbild in 1923, being expanded and renamed Kommando Rowehl in 1935. While officially remaining a civilian unit, it undertook vital secret, high-altitude reconnaissance missions over France and Russia under the cover of commercial Lufthansa airline routes. Indeed, the unit was not officially incorporated into the Luftwaffe until early 1944. In addition to its secret reconnaissance missions, the Verscuchsverband evaluated new and exotic German bombers, fighters and night fighters including the high-altitude Junkers Ju 86R, the Arado Ar 234 and Do 335. Other duties included dropping spies into enemy territory. A further responsibility was the evaluation and comparison of captured Allied aircraft. They toured Luftwaffe operational airfields with their flying war booty under the moniker of "Wanderzirkus Rosarius" (Travelling Circus Rosarius, named after the unit's Commander, Hauptmann 'Ted' Rosarius). This unit operated and tested Spitfires, Mustangs, Lightnings, Thunderbolts, Typhoons, Mosquitos and more. Classic Publications' new book, "On Special Missions", covers all these activities in its 128 pages. The text is chronologically structured and highly readable. The narrative text also calls on the first-hand accounts of aircrew. More than 360 well-captioned photographs of men and machines provide a narrative of their own. A very wide variety of aircraft are included in these photos, reflecting the eclectic nature of this fascinating unit's responsibilties. Fifteen colour profiles by Tom Tullis add even more inspiration for the modeller. These are another highlight, and are well up to the high standards of this well-known artist. 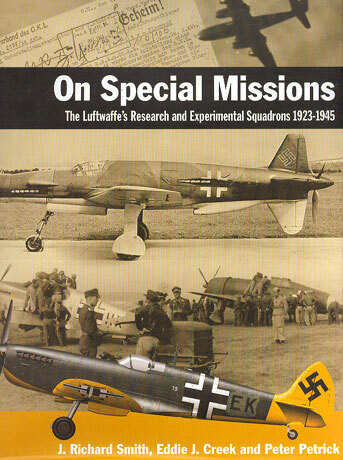 I found "On Special Missions" to be a fascinating story, and also an excellent source of inspiration for the modeller of both Luftwaffe and Allied aircraft models.